A 1947 freeway plan for San Francisco. In 1947, the federal agency Bureau of Public Roads (BPR) and the National Interregional Highway Committee promoted an initiative for a 40,000 mile network of highways in the U.S. 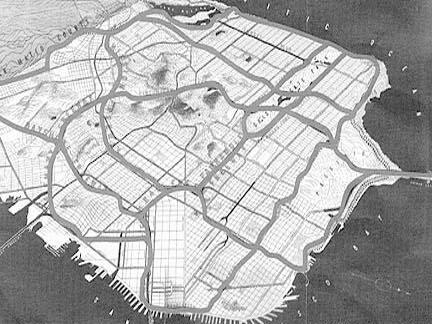 The plan included the freeway scheme for San Francisco seen here. It would have had Golden Gate Park flanked by freeways, with the panhandle completely removed. Battles over the freeway plan were long and ugly, not just in San Francisco but in other parts of the country as well. San Franciscans ferociously opposed the plan and on January 23, 1959, the Freeway Revolt culminated in a resolution by the Board of Supervisors to remove a half dozen freeways from the City's master plan. As a result, construction of the Embarcadero Freeway, which already defaced the waterfront from Folsom Street to Broadway, was halted. The move cost the City tens of millions of dollars in state and federal financing, but saved precious lands and priceless natural beauty in San Francisco. The freeway revolt helped generate public support for BART and bolstered the objective of reducing dependency on freeways and bridges of the Bay Area. The Freeway Revolt lived on in the form of ballot initiatives and counter initiatives aimed at reversing the tide of freeway encroachment on San Francisco. In 1989, an earthquake helped move things along by knocking out the Embarcadero Freeway and parts of the Central Freeway. A lot of people are enthusiastic about freeways so there is plenty of research available on the Internet. Try to find something nice that's written about the Embarcadero Freeway!